A masterpiece torn from the walls of a Dumfriesshire castle by axe-wielding robbers. When word reached art historian Martin Kemp, relaxing at an Italian villa in the summer of 2003, it was a deeply personal shock. He was the man who was responsible for it being identified as an original Leonardo da Vinci, worth millions. And years later he would find himself giving crucial evidence of its authenticity in an Edinburgh court after it was finally recovered. The astonishing tale is fully revealed for the first time in new book Living With Leonardo (Thames & Hudson), which details world-renowned expert Martin’s 50-year fascination with the most famous artist of all time. Martin’s association with the Madonna of the Yarnwinder began when he paid a visit in the late 1980s to Drumlanrig Castle with a group of his students from St Andrews University. “It’s all very well looking at illustrations, but that first time I saw it I realised the quality and the sense of presence,” said Martin, who spent more than 25 years of his career in St Andrews and Glasgow. “Leonardo’s have a special feeling of their own. It had never been examined using the latest scientific technology available. “Leonardo’s paintings were much copied and there was very much a brand in Milan that a lot of people rode along on producing things in that style. However, Martin persuaded the former Duke of Buccleuch that it was worth a proper look at the National Galleries of Scotland where he was a trustee. The Duke drove it up to Edinburgh in the back of his Land Rover and it was subjected to the latest infrared reflectography. “That penetrates deeply into the painting and if you’re lucky you’ll get through to the white-painted underlining which is put on the board before you begin to paint,” explained Martin. “So if you’re drawing on that with charcoal it will show up. “You have to operate very coolly when you’re looking at a painting. You have to examine the technical evidence, pigmentation and a whole barrage of things you throw at it. “All of the time you’re looking for something that stops it being a Leonardo. “You have to be really sure before you go public and make an idiot of yourself. The Buccleuch Madonna is thought to be one of two versions of The Madonna Of The Yardwinder, painted by Leonardo around the same time. Started around 1499, the painting shows the Virgin Mary and baby Jesus holding a yarnwinder, used to collect spun yarn. The shape of the yardwier suggests the cross where Christ was crucified. On Martin’s recommendation a scientific examination of the other version, owned by a dealer in New York, was carried out and showed the same kind of hidden drawings. “The only sensible conclusion was that these two small pictures were developed in the studio as small-scale saleable objects. The painting ultimately went back to Drumlanrig where it was stolen in the daring daylight raid. Four men arrived in a white Volkswagen GTI with two going inside, strong-arming the staff and making off out of a window. Estimates of the painting’s value varied wildly, some up to £50m. Martin was contacted by police asking if there was any way to definitively identify the painting, should it ever be recovered. The thieves did contact loss adjustors for the Duke’s insurers four years after the robbery and police set up a sting operation in a Glasgow city centre solicitors’ offices after apparently agreeing to pay £4.25m. The operation led to arrests and the painting’s recovery. 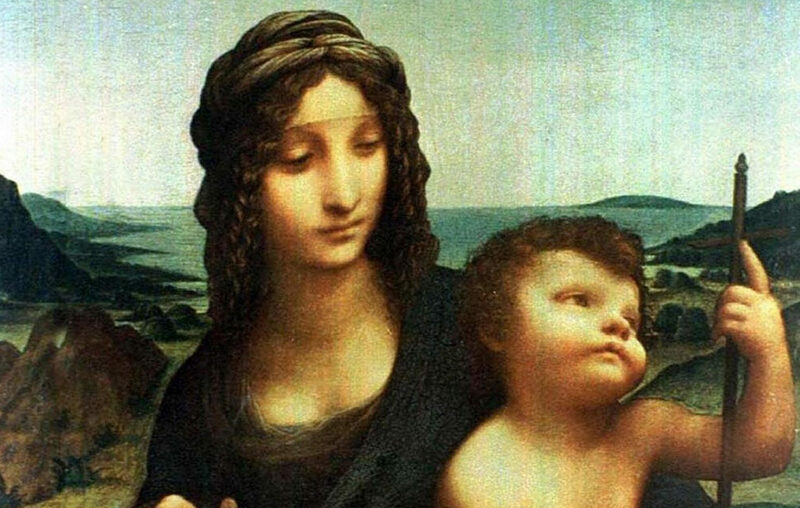 There are many copies and versions of the Madonna With Child but only two can be directly linked to Leonardo, including the Buccleuch Madonna. If the painting had been a straightforward copy completed by one of Leonardo’s pupils or followers, there would have none of the underdrawings, dramatically exposed by infrared analysis. The child’s right arm had been repositioned. The Virgin’s hand had been carefully adjusted, particularly the thumb which had been more tucked in. There once had been an arch to the left of the Virgin’s head. There had been an earlier landscape with higher hills than those in the completed painting. Martin was asked to travel to Edinburgh where fresh infrared analysis was done to conclusively prove the painting was genuine. He was called to testify at the trial at Edinburgh High Court where not proven verdicts were returned on the three men who had been arrested. The painting has since been on display at the National Galleries in Edinburgh. “We put the picture back through the infrared equipment and showed the marks underneath that no forger could have known,” said Martin. 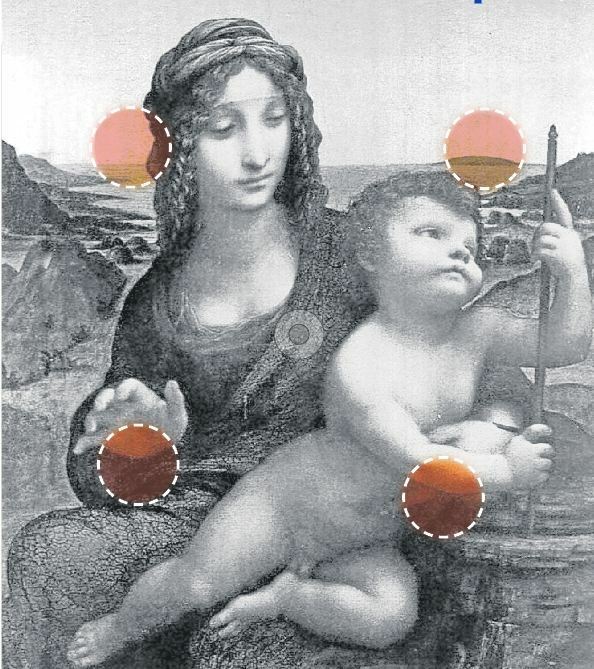 But then da Vinci’s work stimulates incidents. When Martin was invited to a private view in London of another Leonardo work, Salvator Mundi, he recognised a rock crystal in an orb held by Christ. Martin, who was trained as a geologist, then got a similar rock crystal sphere and placed it under as identical as possible light conditions to confirm it looked the same. The painting was sold at auction last November by Christie’s in New York for £320m. Salvator Mundi is one of fewer than 20 known works by da Vinci and only two others, the Yarnwinders, are similarly thought to be in private hands. After the sale, art dealer Phillip Mould, from BBC TV’s Fake or Fortune, said that if a Yarnwinder came to auction now it would probably be the first $1 billion sale. Martin said: “He’s probably the greatest icon of visual culture in the world. The myths, legends and public attention he attracts is beyond anybody else.